All the Radio Shacks are dead. adioS, or something. But wait, what’s this? There are new Radio Shacks opening. Here’s one in Idaho, and here’s another in Claremore, Oklahoma. This isn’t like the ‘Blockbuster Video in Nome, Alaska’ that clings on by virtue of being so remote; Claremore isn’t that far from Tulsa, and the one in Idaho is in a town with a population of 50,000. Are these corporate stores, or are they the (cool) independent Radio Shacks? Are there component drawers? Anyone want to take a field trip and report? A few years ago, [cnxsoft] bought a Sonoff WiFi switch to control a well pump. Despite this being a way to control the flow of massive amounts of water with an Internet of Things thing, we’re still rocking it antediluvian style, and for the most part this WiFi-connected relay worked well. Until it didn’t. For the past few days, the switch wouldn’t connect to the network, so [cnxsoft] cracked it open to figure out why. There was one burnt component, and more than one electrocuted insect. Apparently, an ant bridged two pins, was shortly electrocuted, and toasted a resistor. It’s a bug, a real bug, in an Internet of Things thing. eInk is coming to license plates? Apparently. Since an eInk license plate already includes some electronics, it wouldn’t be much to add some tracking hardware for a surveillance state. Hold up, it’s a press release about crypto hardware. No, not that crypto, the other crypto. Asus has announced a new motherboard that is capable of supporting twenty graphics cards. This isn’t a six-foot-wide motherboard; it’s designed especially for coin mining, and for that, the graphics cards really only need a PCIe x1 connection. The real trick here is not using PCIe headers, and instead piping everything over vertical-mount USB ports. Yes, this is a slight cabling nightmare. So, you still think the early 80s with fluorinert waterfalls and Blinkenlights that played Game of Life was the pinnacle of style in computer hardware? No, this is it right here. Here’s a book you should read. Ignition! : An Informal History of Liquid Rocket Propellants by John Drury Clark is a fantastic book about how modern liquid rocket fuel came to be. Want to know why 60s cartoons and spy movies always referenced a ‘secret rocket fuel formula’ when kerosene and liquid oxygen work just fine? This is that. Back when we covered it, the book, used, on Amazon, cost $500. It’s now in print again and priced reasonably. It’s on the Inc. 9 Powerful Books Elon Musk Recommends list, so you know it’s good. Thanks, [Ben] for sending this one in on the tip line. After starting out with a demo of the firmware in action before and after his modification, he explains how the E-paper works. The display is made up of many isolated chambers, each containing charged particles in a liquid. For example, the positive particles might be black and the negative might be white. By putting an electric field across each chamber, the white particles would be attracted to one end while the black would be attracted to the other, which could be the end you’re looking at. He also explains how it’s possible to get a third color by using different sized particles along with some extra manipulation of the electric field. And he talks about the issue of burn-in and how to avoid it. Having given us that background, he then walks us through some of the firmware and shows how he modified it to make it faster, namely by researching various datasheets and subsequently modifying some look-up-tables. Turning back to the hardware, he shows how he scratches out some traces so that he can attach scope probes. This alone seems like a notable achievement, though he points out that the conductive layer holds up well to his scratching. At that point he analyses the signals while running some demos. The result is the very informative, interesting and entertaining video which you can watch below. E-ink displays are becoming almost common in DIY electronics circles, and now we have very capable, low-power microcontrollers, some of which feature some sort of wireless connectivity. Combine these two, and you have the potential for a basic information screen — a low-power device that always displays some sort of relevant information, whether it’s the date or the weather. For their Hackaday Prize entry, [Wenting] and [Dong] are building an e-ink calendar. It’s a calendar, it displays bitmaps, it can display the time, and with a little more hacking it can display the weather, current traffic, or train schedule. If this were the 90s, we would have called this an information appliance, and it would have blown everyone’s minds. The current design of this e-ink calendar uses an 800 x 600 pixel display working in 16-level grayscale mode. The processor is an STM32F4, and in a cost-reducing revision, an external SRAM was thrown out and the frame buffer was moved to the internal RAM. The e-ink display is actually pretty quick, allowing for greater than 10 FPS in 1-bit mode. As with any e-ink project, driving the display is a minor nightmare, but [Wenting] is able to push a few frames per second to the display. That’s good enough for a device that shouldn’t actually change all that much — this is a calendar, after all. You should be watching the Doctor Who Christmas special right now. Does anyone know when the Resturant at the End of the Universe spinoff is airing? We have a contest going on right now. It’s the 1 kB Challenge, a contest that challenges you to do the most with a kilobyte of machine code. The deadline is January 5th, so get cracking. A few years ago, [Kwabena] created the OpenMV, a Python-powered machine vision module that doesn’t require a separate computer. It’s awesome, and we’re going to have his talk from the Hackaday SuperConference up shortly. Now the OpenMV is getting an upgrade. The upgrades include an ARM Cortex M7, more RAM, more heap for less money. Here’s a link to preorder. There ain’t no demoscene party like an Amtrak demoscene party because an Amtrak demoscene party lasts ten hours. E-paper displays are fancy, cool, and low-power. Putting them in a project, however, is difficult. You need to acquire these display modules, and this has usually been a pain. Now Eink has a web shop where you can peruse and purchase epaper display modules and drivers. [Kris] built a pair of STM32L4 dev boards that are easily programmed in the Arduino IDE. Now he’s putting these boards up on Kickstarter. The prices are reasonable – $15 for the smaller of the pair, and $25 for the bigger one. Remember, kids: ARM is the future, at least until RISC-V takes over. This is how you do holiday greeting cards. Didn’t get what you want for Christmas? Don’t worry, Amazon still has A Million Random Digits with 100,000 Normal Deviates in stock. It’s also available on audible dot com. Sometimes we don’t have time to sit down and read a million random digits but with audible dot com, you can listen to a million random digits in audio book format. That’s audible dot com please give us money. This is the last Hackaday Links post of the year, which means it’s time for one of our most cherished traditions: reviewing our readership in North Korea. It’s been a banner year for Hackaday in the Democratic People’s Republic of North Korea. The readership has exploded in 2016, with a gain of nearly 300%. 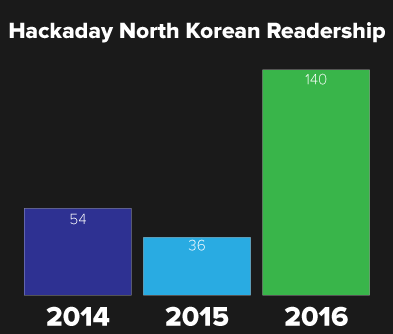 To put that in perspective, in 2015 we had thirty-six views from North Korea across every page on Hackaday. In 2016, that number increased to one hundred and forty. That’s a phenomenal increase and a yearly growth that is unheard of in the publishing industry. We’d like to tip our hat to all our North Korean reader, and we’re looking forward to serving you in 2017. 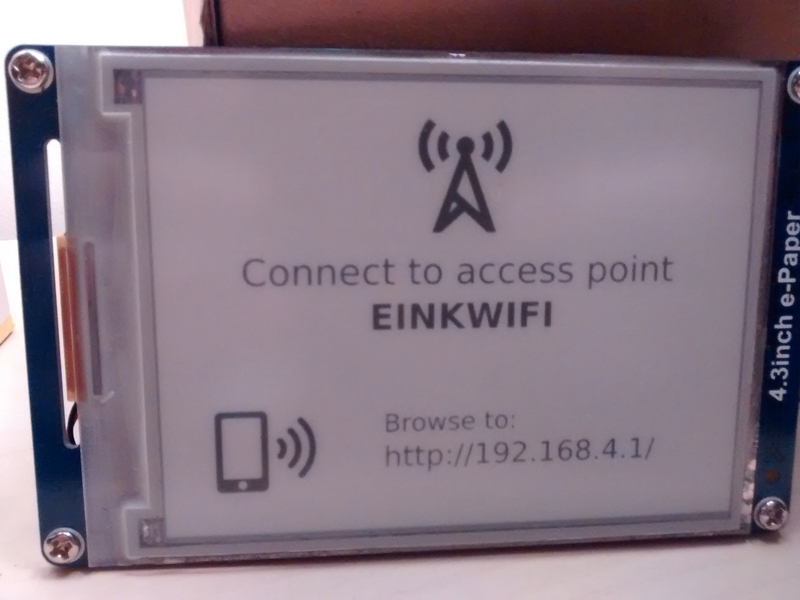 [David] created a great looking e-ink WiFi display project that works a little like a network-connected picture frame with a few improvements over other similar projects. With the help of an ESP8266 it boots up, grabs an 800×600 image over the network, updates the screen, then goes back to sleep. Thanks to some reverse engineering, he was able to make his own firmware for the onboard controller to handle the low-level driving of the display. Since e-ink displays require no power to hold an image and the rest of the unit spends most of the time either asleep or off, power use is extremely low. [David] hopes to go months without needing to recharge the internal lithium-polymer battery. Lithium-polymer charger (top left); Single-cell lithium-polymer battery (center); pullups and power cutoff for nonessential electronics (green board, lower right); ESP866 (lower left). We previously featured another WiFi-connected e-ink display project that was in fact also the inspiration for this version. [David] uses a 4.3″ 800×600 GDE043A e-ink display and wrote his own firmware for the STM32F103ZE ARM CortexM3 SoC used as a display controller, a process that required some reverse engineering but was aided by the manufacturer providing a closed-source driver for him to use. [David] writes that some reverse-engineering work for this display had already been done, but he had such a hard time getting a clear understanding from it that he reverse engineered the firmware anyway and used the documents mainly for validation and guidance. As a result, [David] was able to make use of the low-level driver electronics already present on the board instead of having to make and interface his own. E-ink displays have some unusual driving requirements which include generating relatively high positive and negative voltages, and rapidly switching them when updating the display. Taking advantage of the board’s existing low-level driver electronics was a big benefit. 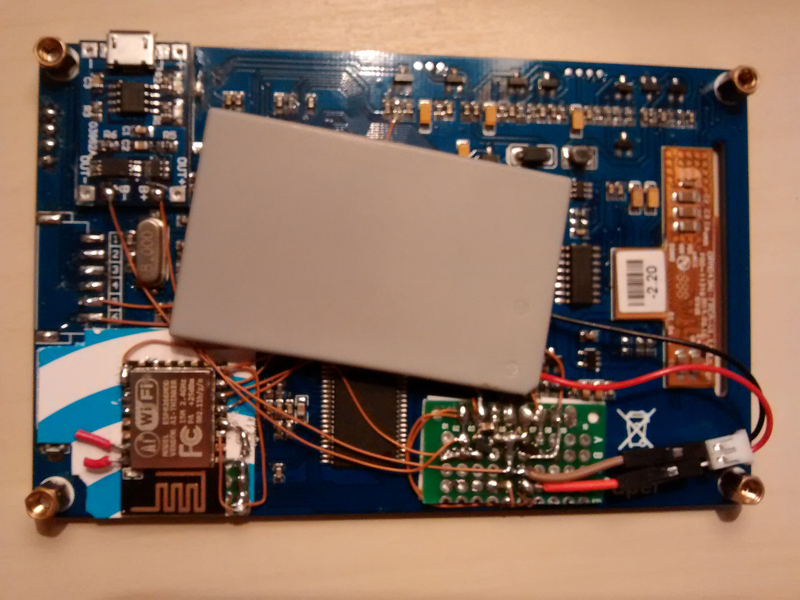 The ESP8266 rounds out the project by taking care of periodically booting things up, connecting to the wireless network and downloading an image, feeding the image data to the STM32 to update the display, then disconnecting power from all non-essential electronics and going back to sleep. We especially like how the unit automatically creates a WiFi access point to allow easy (re)configuring. There’s one more nice touch. [David] goes the extra mile with server software (in the form of PHP scripts) to design screens for the display with data like weather forecasts, stock prices, and exchange rates. Check it out in the project’s github repository. [David Schneider] had trouble seeing his bike computer in the sunlight and wanted a navigation solution that would be both readable and not require a smart phone. In good hacker fashion, [David] married a Raspberry Pi and a Kindle Touch (the kind with the E-ink display). The Kindle provides a large and easy-to-read display. [David] was worried about violating the DCMA by modifying the Kindle. Turns out, he didn’t have to. He simply used the book reader’s Web browser and set the Pi up as a wireless access point. One clever wrinkle: Apparently, the Kindle tries to phone home to Amazon when it connects to a wireless network. If it can’t find Amazon, it assumes there’s no valid network and treats the network as invalid. To solve this issue, [David] causes the Pi to spoof the Kindle into thinking it gets a valid response from Amazon. The other work around was to change how the Python application on the Pi updates the screen. [David] found that without that optimization, the constant redrawing on the E-ink display was annoying. The Pi-related hardware includes a GPS, some reed switches, and a WiFi dongle.